Writing an obituary can be hard, but you don’t need to go without help. 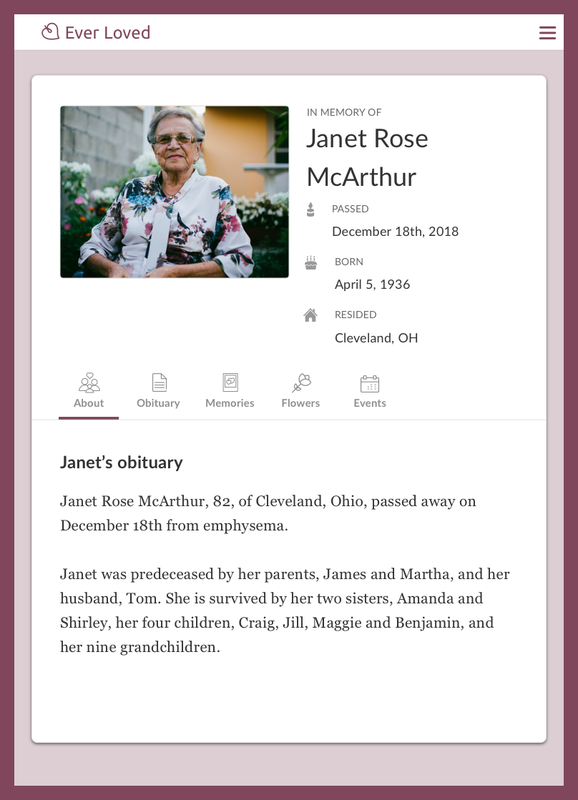 That’s why we’ve put together a collection of free obituary templates, obituary examples and obituary samples to help you write an amazing obituary for your loved one. Each one is an easy-to-follow, fill-in-the-blank obituary template that you can customize for your needs. If you’re considering writing an obituary, remember that first and foremost it is a declaration of loss, an acknowledgement of grief, and an expression of joy all-in-one. It celebrates the life of a loved one in a way that few other ways can. So don’t hesitate to work beyond the obituary templates provided by inserting a few anecdotes, memories, and even inside jokes that your community might appreciate. Remember: this is an opportunity to commemorate a loved one in your own special way. If they loved music, why not list a few of their favorite songs? Of course it’s all up to you. Historically, this communication of a death would happen via newspaper, where a family member would pay a newspaper several hundred dollars to publish a newspaper obituary. However, you can now write and publish an obituary online for free on Ever Loved. 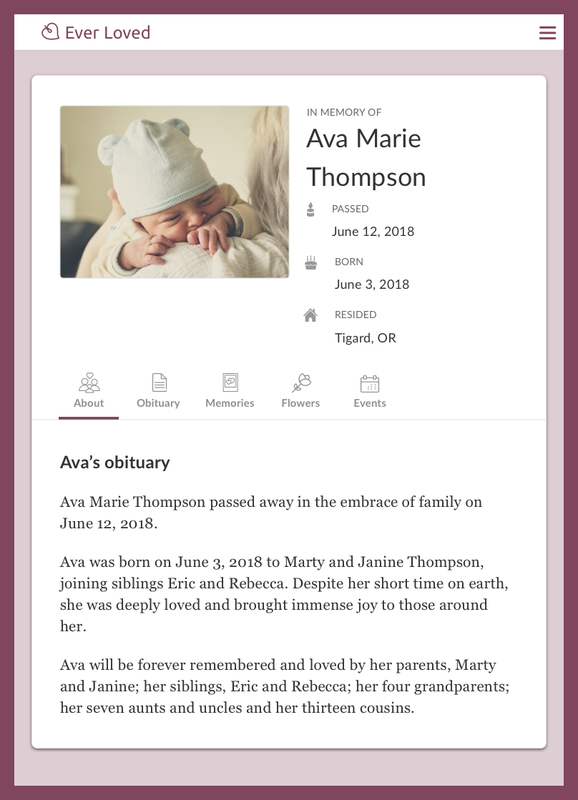 So once you’ve chosen an obituary template that you like, you can easily write the obituary and post it in minutes for friends and family to view. Here are a few free obituary templates to help you get started writing an obituary. If you'd like to learn more about writing an obituary, we've explained how to write an obituary in detail as well. We hope these fill-in-the-blank obituary writing templates will provide you with the tools you need to honor a loved one while also following traditional practices. [Full name], [age], of [place of residence], passed away on [date of death] from [cause of death]. [First name] was predeceased by [list of family member who have passed away]. [She/He] is survived by [list of family members who are still alive]. Janet Rose McArthur, 82, of Cleveland, Ohio, passed away on December 18th from emphysema. Janet was predeceased by her parents, James and Martha, and her husband, Tom. She is survived by her two sisters, Amanda and Shirley, her four children, Craig, Jill, Maggie and Benjamin, and her nine grandchildren. [Full name], [age], of [place of residence], passed away on [date of death] after a [descriptor] battle with [cause of death]. [First name] was born on [date and year of birth] to [parents] in [city of birth]. After graduating from [name of high school] in [high school graduation year], [he/she] went on to study [college major] at [college name]. After graduation, [he/she] landed [his/her] first job as a [job title] for [company], kicking off a [career length] career in [field]. In [year they met], [he/she] met [spouse name], and they wed in [marriage year], going on to have [number of children] children, [list of children’s names]. After retiring in [retirement year], [first name] spent [his/her] time [list of favorite activities]. Louis Park, 75, of Los Angeles, CA, passed away on March 31st after a valiant battle with stomach cancer. Louis was born on January 27th, 1943 to David and Esther Park in San Francisco, CA. After graduating from Galileo High School in 1961, he went on to study English literature at University of California Irvine. After graduation, he landed his first job as a writer for the Los Angeles Daily News, kicking off a 35-year career in journalism. In 1968, he met Jane (McAllister) Lee, and they wed in 1970, going on to have three children, Megan, Harold and Chris. After retiring in 1998, Louis spent his time volunteering at the Los Angeles Historical Society, gardening, rooting for LA Dodgers, and spoiling his 8 grandchildren as much as possible. Louis is predeceased by his parents and his brother, James. He is survived by his wife, Jane Lee; his sister, Sophia (Arnold) Cho; his three children, Megan (Thomas) Jackson, Harold Lee and Chris (Amanda) Lee; and his eight grandchildren, David, Jack, Liz, Eric, Daniel, Hannah, Gace and Kari. [Full name] went home to Jesus on [date of death] at age [age]. [First name] was born to [parents’ names] on [date of birth] in [place of birth]. As a child, [description of childhood activities]. In addition to being a dedicated and loving mother, [first name] also loved [favorite activities]. Throughout [her/his] entire life, [he/she] held an unwavering faith in God, which [he/she] shared with those who surrounded [him/her]. Debbie joins [list of family members who have already passed] in Heaven. [She/He] is survived by [list of family members who are still alive]. Deborah “Debbie” Anne Sanders went home to Jesus on July 7, 2018 at age 72. Debbie was born to Adam and Mary Cohen on January 2, 1946 in Port Wing, Wisconsin. As a child, she excelled in school and ran track on her school’s varsity team. Debbie met her husband, Keith Sanders in 1963 at a church dance. They married two years later on June 23, 1965 and went on to have five children, Anne, Christina, Max, Jane and Tommy. In 1972, they moved their family to Madison, Wisconsin. In addition to being a dedicated and loving mother, Debbie also loved working in her garden, staying actively involved in the PTA, and holding various volunteer roles at High Point Church. Throughout her entire life, she held an unwavering faith in God, which she shared with those who surrounded her. Debbie joins her parents, Adam and Mary, and her brother, David, in Heaven. She is survived by her husband, Keith, her sisters, Theresa and Catherine, her children, Anne (Jack), Christina, Max (Amanda), Jane (Bill) and Tommy (Amber), and her grandchildren, Suzie, Max Jr. and Michael. [Full name] passed away on [date of death] at the age of [age], following [cause of death]. [First name] was born in [place of birth] on [date of birth] to parents, [names of parents]. [He/She] was a [one or two attributes] child, always [common activities that demonstrate personality]. [She/He] proudly stated that [he/she] wanted to be a [career of choice] when [he/she] grew up. [First name] also loved [other favorite activities]. After [First name] was…[describe how they dealt with their illness, if applicable]. [First name]’s memory will forever be cherished by [list of family members and other important life figures]. Edgar Fernandez passed away on February 23, 2018 at the age of 9, following a 2-year battle with brain cancer. Edgar was born in San Antonio, Texas on March 1, 2008 to parents, Jessica and Juan Fernandez. He was an active and inquisitive child, always wanting to understand how things worked and occasionally getting in minor trouble for taking household items apart and trying to put them back together. He proudly stated that he wanted to be an inventor when he grew up. Edgar also loved baseball and spent many afternoon playing games with his friends. After Edgar was diagnosed with brain cancer in 2016, he rarely lost his spirit. Even when confined to a hospital bed for extended periods, he excitedly watched baseball games and talked about them with parents and medical team. 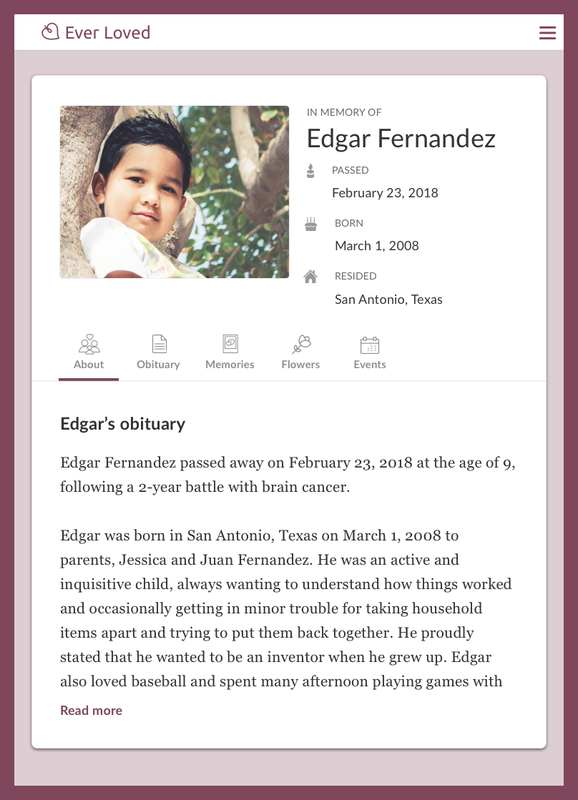 Edgar’s memory will forever be cherished by his parents, Jessica and Juan and his grandparents, Javier and Maria Fernandez and Martha and Bill Atkins, as well as many cousins, aunts, uncles, and friends. [Full name] passed away in the embrace of family on [date of death] at [[place of death]. [First name] was born on [date of birth] to [names of parents], joining siblings [names of parents]. Despite [his/her] short time on earth, [she/he] was deeply loved and brought immense joy to those around [her/him]. [First name] will be forever remembered and loved by [list of family members]. Ava Marie Thompson passed away in the embrace of family on June 12, 2018 at Four Saints Hospital. Ava was born on June 3, 2018 to Marty and Janine Thompson, joining siblings Eric and Rebecca. Despite her short time on earth, she was deeply loved and brought immense joy to those around her. Ava will be forever remembered and loved by her parents, Marty and Janine; her siblings, Eric and Rebecca; her four grandparents; her seven aunts and uncles and her thirteen cousins. It can be beneficial to use an obituary writing template, since it can be difficult to capture someone's life in a single obituary, especially while grieving. An obituary can help acknowledge and announce the death so that a community may come together, commemorate a life well lived, and provide a community with ways that they can participate in celebrating the life of a loved one. The best obituaries aren’t ones that are published in the most well-known newspapers. Rather, obituaries that are written well and from the heart leave the biggest impact. Learn how to write an obituary by reading a related article on Ever Loved. Interested in publishing an obituary for free? 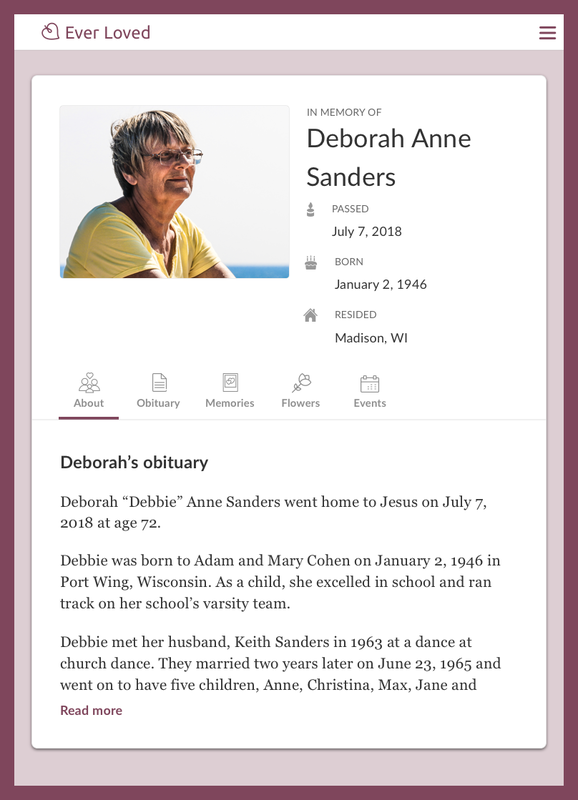 Start by creating a memorial website for a loved one on Ever Loved to get started and add an obituary, funeral events, track RSVPs, add photos, and more.